The decline in physical and cognitive abilities are natural parts of aging. People who enter their golden year’s experience changes that affect their capability to deal with a daily routine. While some people find it easy to adapt and keep pace with the changes brought by the progression of age, others find it difficult. How will you find out if an elder loved one needs assistance? Our years of experience as a provider of Home Health Care in Metro Vancouver have taught us that while old age beyond doubt calls for support, there are unprecedented incidents. There are events in an older adult’s life that can advance the need for assistance such as illnesses and diseases. A lot of seniors are daunted by the idea of losing their independence. As a result, they refuse to ask for help even when they genuinely need it in the assumption that if they do, this means it will take away their freedom. This is why you need to open your eyes and ears. Observe carefully. Through it, you will find tale signs that indicate a dire need for assistance. Sometimes, all you need to do is ask your loved one directly if they need help. When you see something that concerns you, approach your loved one with an open mind. The conversation can go two ways. Either your loved one will open up about the difficulties they experienced due to aging or your loved one will assure you everything is fine and that there is nothing to worry about. When faced with a hesitant behavior, instead of insisting they need help, offer help. Take for example you open the refrigerator and find it empty. Offer to shop for groceries without pushing your loved one to hire someone to do it for them. When your loved one does admit to needing help, ask yourself, are you prepared to take the role of a caregiver? As a caregiver, you will be responsible for monitoring and be promoting the welfare of your senior loved one. If you find yourself incapable of handling all of the responsibilities, seek help from a professional caregiver. Peachtacular Home Health Care specializes in providing care for seniors at home. 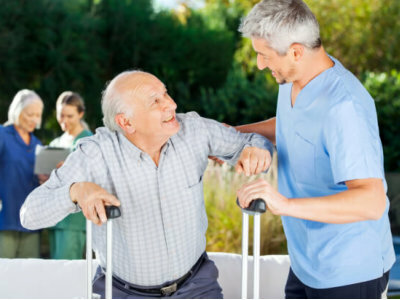 Our Private Affordable Home Health Care services focus on providing care and assistance with day to day activities while upholding a senior’s independence. Ensure your dear loved one receives quality care and assistance when you choose Peachtacular Home Health Care. If you have any questions about our home care services, please do not hesitate to call us at 778-859-2695 or send us a message at info@peachtacularhhc.com. We are more than happy to walk you through our services.